Free VPN is the ultimate iOS VPN. Free VPN is a 100% unlimited VPN that does not require any type of registration. Free VPN gives you the freedom to be completely anonymous. All of your traffic is encrypted while Free VPN is on. Free VPN protects your privacy and identity and allows you to browse the web anonymously without fear of being tracked. New update has dumb deals for watching ads. Not worth my time. Deleted the app. 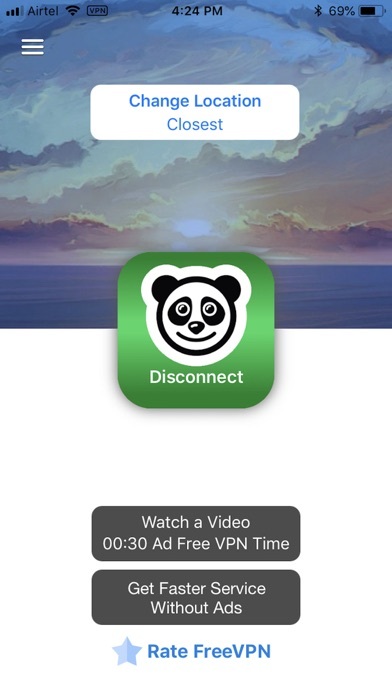 I watch ads upon ads to get minutes of vpn, and now they do packs such as: 10 ads for5 hours of vpn, yet after watching all the ads I only receive 15 minutes. Pathetic . Too many ads. I was promised a free 24 hour package if I l watched 10 Advertisements totaling about four minutes. Unfortunately, they did not credit my account. Bait and switch? Time will tell. The ads are too much, you constantly have to watch many ads for time. They give you only 15 mins worth of VPN time. If you want extra, you gotta watch add after add. Horrible. If you what to use less the 3 hours you can use. It is not free VPN Ads will disturb you lot. 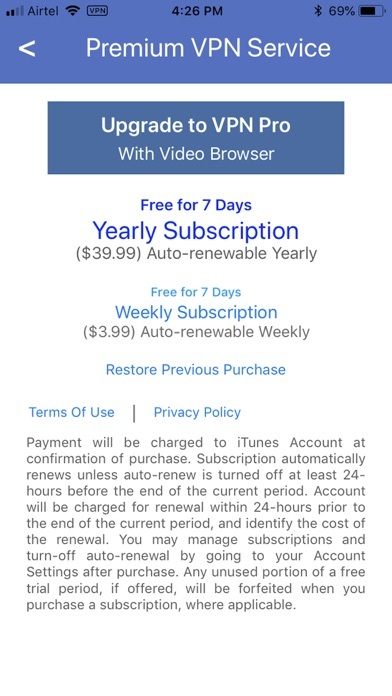 This is first app in App Store I seen too many pop ups If we find a Sloutions to remove this pop up it will be good. Previously we use to find a “x” mark to close the pop up. Now a days with new pop up we couldn’t find it. If you are trying to give to free make it free If you are trying to keep purchasing keep purchasing. Please don’t confuse people mind with you ads. “I request team of apple to review the app ads.” We are unable to close the ads that are popping up. If this go now happen plz delete the app from store User should understand how to delete the ads pops. Team of apple need verify third party ads for a each and every application and approve or it must guide the user how to overcome this ads in regular basis. This is the best VPN who I used .